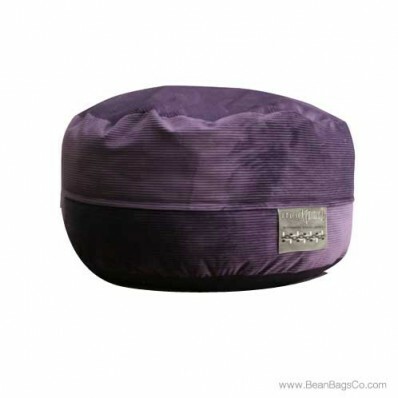 Express yourself with your décor by choosing the Mod FX Mod Pod Classic 5-foot bean bag lounger in vibrant purple cord. This tough, durable piece will give you relaxing service for years to come and will meet all your casual furniture needs for both kids and adults. In fact, you can expect this lounger to quickly become your family’s favorite spot for watching television, listening to music, reading, or engaging in any type of leisure activity. The soft cord outer material is durable and easy to clean; just wipe it with a damp cloth and its beauty and functionality are preserved. The 100 percent recycled fiberfill is not only soft and cozy but supports you ergonomically, with head, neck and back firmness that is unparalleled in other soft furniture. Whether you use this piece as adult furniture or junior furniture, you gain the space of a loveseat or sofa without sacrificing anything in quality, durability, or great looks. Add all the colors of this classic lounger to your collection. It's available in chocolate, midnight, black and berry. 51" x 51" x 34"